Q: Your art has been shown in Austin, San Antonio, Kansas City, London, Miami, New York and Santa Fe - why did you decide to make Austin your home? A: Austin is the mecca for the weird, creative and fun, and people travel here as if on a pilgrimage to see what it is all about. I visited Austin for the first time after I met singer Stevie Ray Vaughan at a concert in Oklahoma City, where I grew up. He encouraged me to come find him at Antone&apos;s nightclub in Austin, which I did. Q: Tell us about XYZ Atlas. Why is the project significant? A: XYZ Atlas grew out of a project that started as the Hedonic Map of Austin. I was thinking about how we form attachments to places through experiences; how we define our community by going to the same places for connection over and over again, like the farmers&apos; market or the Continental Club; and how to record our experiences. 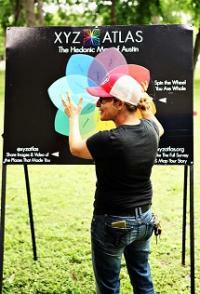 Q: Where can visitors experience XYZ Atlas: The Hedonic Map of Austin? 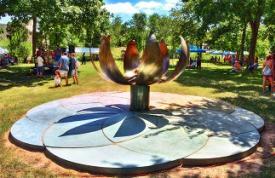 A: "The Dance of the Cosmos," a solar-powered, steel lotus flower that opens and closes, is on exhibit at the Elisabet Ney Museum in Hyde Park through spring 2016. The work is a 3-D diagram of emotional wholeness to show that we need all of our feelings and experiences, both positive and negative, to be whole. The 2-D artworks are also on display at the University of Texas at Austin&apos;s Department of Psychology. Q: Where is your favorite place to experience art in Austin? A: I enjoy the outdoors, and I like our public-art collection, so my favorite place to experience art is outside on a bike. I especially like Erin Curtis&apos; ceramic tile pieces on 3rd Street. I also enjoy the exhibit at the People&apos;s Gallery at City Hall, and I love the Elisabet Ney Museum. Q: What is your favorite place to eat in town? A: It has been amazing to live in east Austin for so long. They used to not deliver pizza east of I-35, and now I&apos;m walking distance to the best food. Favorites include Counter Cafe, Buenos Aires Café, Miklethwait Craft Meats, Cenote, Hillside Farmacy, El Chilito and Launderette. Q: Any other tips for first-time Austin visitors? A: Walk, bike and talk to people. Ask them what is the most fun they&apos;ve had here and what&apos;s going on this weekend. Everyone&apos;s an expert on hedonism here. Q: What&apos;s in store for you for the rest of 2015 and 2016? What significant projects/exhibits should visitors keep an eye out for? A: For me, making art! I&apos;m learning how to turn my large-scale artworks into 3-D-printed pieces - and there are so many options in that evolving technology. I&apos;m honored to be working on the Drawing Lines project, where 10 different artists are creating projects for an Austin City Council District. The Contemporary&apos;s "Strange Pilgrims" exhibit looks exciting. I&apos;m a huge fan of artists Bruce Nauman and Nancy Holt.